This post was written by Paint Love Operations intern, Maya Glass. To learn more about Paint Love's internship program, visit www.gopaintlove.org/careers. Today was awesome! 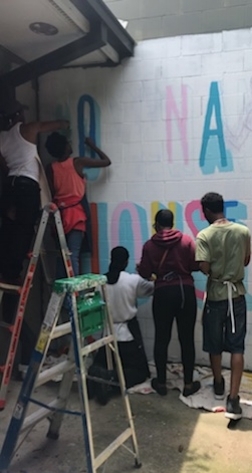 Even in the muggy heat, the youth and volunteers from Gas South did an wonderful job bringing colorful life to the Covenant House Mural on day one. Covenant House is a shelter serving teens and young adults that are facing homelessness. It was fun (and humbling) to see the youth crack animated jokes and watch their personalities bounce off one another. I learned a lot from these youth in more ways than one, but today's lesson was to keep laughing and smiling in spite of life's trials and [heated] tribulations. And we're all excited to see the finished results tomorrow on day two! Thank you Gas South and Covenant House!